A garage door is the largest moving appliance in the home. It can also be one of the least thought about when it comes to maintinance. Proper installation, operation and maintenance and testing of the garage door and garage door operator are necessary to provide safe, trouble-free operation. An improperly adjusted garage door or automatic opener can exert deadly force when the door closes. 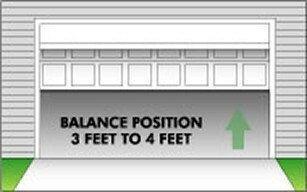 This could lead to serious injury or death from being hit by a closing garage door or from being trapped under the door. A few simple precautions can protect your family and friends from potential harm. Please take a few minutes to read the following safety and maintenance tips. Refer to your garage door and opener owner's manual for details specific to the model you own. Then check the operation of your garage door and automatic opener. "Testing and Maintaining The Garage Door"
Regularly lubricate the moving parts of the door. Consult the door owner's manual for the manufacturer's recommendation. Consult owner's manuals for additional recommended maintenance for your models of door and opener. If you have a garage door opener, operate the door closed first then use the release mechanism so you can operate the door by hand when doing this test. Springs, Rollers, Pulleys, Cables and Track Lubrication, Door Balance.